I found a great sense of style and theatre at Dersley Manor, with each room uniquely themed and decorated after classic movies. And Johan and his team really go out of their way to make you feel welcome. 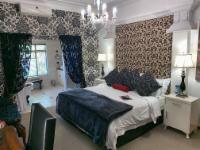 Dersley Manor, 10 minutes drive from the centre of Bloemfontein, is a boutique guest house offering 15 lavish Oscar-winning movie-themed rooms in the heart of the northern suburbs. 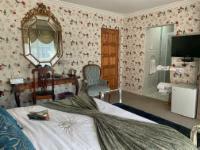 Uniquely and individually decorated rooms with an ornate mix of antique and contemporary touches, feature air-conditioning, Dstv, minibar, coffee/tea station, hairdryer, writing desk and safe. Special touches, a turn down service, robe and slippers make for an unforgettable stay. In the morning enjoy a full English breakfast, with special dietary needs catered for, and an à la carte dinner menu offered every night . Conference and wedding venue for 30 delegates. 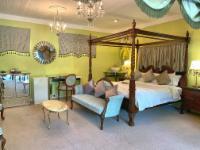 The Manor is within 5 minutes drive from North Ridge Mall, Virgin Active gym, Orchid House and Oliewenhuis Art Museum. The Airport is less than 15 minutes away. Take Kenneth Kaunda turn-off into Bloemfontein. Drive 5.2km (past Northridge Mall) and turn right into Deal Road. Drive 200m and arrive at destination on your right of the double lane.